I was busy preparing lunch for my twin babies and I when I flicked on the radio, as I normally do during meal times. CBC Radio’s Maritime Noon was accepting calls about a topic close to my heart: women’s fitness at mid-life, and how we often struggle to balance the need to prioritize our health while feeling pressure to achieve the “perfect” body. I have never grabbed the phone to dial faster in my life. I feel so passionate about this, because as a mom of three young boys, I have learned that the moment I tossed ideals around the number on the scale, clothes sizes and feeling the need to look a certain way out the window, and learned to enjoy fitness and enjoy healthy eating, everything started to fall into place. LISTEN to the show at 38:20. The radio show was hosting Samantha Brennan and Tracy Isaacs, authors of “Fit at Mid-Life: a Feminist Fitness Journey.” The women also blog at Fit is a Feminist Issue. In the book and on the blog, Sam and Tracy – academic deans at two Ontario universities – share their journey to reach peak fitness by the age of 50, all while challenging modern fitness culture from a feminist perspective. I was fortunate enough to share my own personal experience with making fitness an important part of my life as a 35-year-old mom (does that make me middle-aged?!). I wanted to let listeners know that although my life is busy with three young boys, I have managed to return to a healthy lifestyle thanks to the workouts and nutritional guidance from 3rd Degree Training in Saint John. The host asked if my goals have changed over the years, and since having children. Absolutely, I said. My first goal is so simple: to feel good. Secondly, I want to be in good enough shape to run half-marathons again, and hopefully another (injury-free) marathon one day. If my jeans fit better and I lose a few pounds and inches, I truly regard this as a bonus. Tending to the needs of young children can be extremely tiring and at times exasperating. Carving out time in a busy week to exercise pays me dividends in so many ways. I have crept out of the fog of the newborn days and I now feel stronger, more energized and my mood is lifted up so I can better take on the daily challenges of motherhood and life in general. As a woman, and a mother, I have a deep respect for my body and that fact that I have been able to carry and give birth to three beautiful boys. It’s easier to treat my body, which is both beautiful and imperfect, as a temple, when you think of it from that point of view. Of course it helps that I honestly enjoy working out. I love it. If you can find something you love to do while getting active, it makes all the difference. Throw out the scale and focus on what makes you feel good, and the rest will come. I have also noticed that once I started back down the healthy path and saw some results – whether it was attempting a full push-up or feeling less-winded after a sprint – it encouraged me to continue eating healthy, whole foods and continue challenging myself during workouts. I have also set myself some running goals for the summer. It was so fun to share my thoughts on Maritime Noon (even though Callum was making his voice heard!) and lucky me – my name was drawn to win the book! I look forward to reading more about Sam and Tracy’s journey. Saint John lawyer Nathalie Godbout was pregnant with her eldest child, now 10, when she was the incoming chairwoman of the Saint John Board of Trade — the third woman to hold the post in an organization that turns 150 this year. “I can remember back then, the most popular question was ‘How are you going to do this?’” says Godbout who, at the time, was also a new partner with Lawson Creamer. “How does anybody do it? There are two parents in our household, not just one,” says Godbout, who recently opened her own boutique firm with colleague Cathy Fawcett in a stunning historic building on Hazen Street that pre-dates the Great Fire of 1877. Godbout, now 47, not only “did it” with her first baby -= going back to work three weeks after she was born — but again three years later with her second child, nursing each for a full year while managing her busy practice, and while her husband, Jim Lawlor, cared for their daughters. Her career has flourished as she built a reputation as a discreet and capable malpractice defence lawyer. She received the prestigious Queen’s Counsel, or Q.C. designation and a YMCA Women of Distinction Award last year. And, on May 12, she is set to receive the Muriel Corkery-Ryan Q.C. Award, which recognizes an exceptional person who has taken risks, fostered change and ultimately opened doors for female lawyers. The award, presented by the Canadian Bar Association’s New Brunswick branch, will be presented at a conference on embracing change and overcoming obstacles at the Hilton Hotel. For Godbout, the path has not always been smooth, and while she says she has it easier than female lawyers did 50 years ago, she has experienced a subtle form of sexism faced by many professional women today. For example, while meeting with colleagues, a bid to attract new clients may be met with skepticism by her peers, while the man sitting next to her would get full support for another pitch. Even as more female lawyers enter the profession, they are more likely to leave it within their first 10 years for many reasons, Godbout says. For women — and not only lawyers — who choose to have children, it may be more difficult to get a job, keep your job, or it’s seen as a burden on an employer, she says. That’s what led in part to the birth of her firm, which opened its doors last December. It’s a place where lawyers and staff find a balance that results in what they say is great client service and a lifestyle that meets their needs as professionals as well as their families at home. After years of mentoring and meeting with young female lawyers — often in places well “off the grid” — where Godbout would offer her advice, she now aims to model how a modern practice led by two women in the Maritimes can look and feel. Godbout articled at Stewart McKelvey in Saint John before joining Gilbert McGloan Gillis for 12 years, six of those as partner. When she “parachuted” into Lawson Creamer as a partner, she was six months pregnant, she says. The team was “tremendously supportive” over her decade at the firm. The move to open Godbout Fawcett was the dream she never knew she had, she says, resulting in a design that “feels better” than a traditional law firm. Along with her advocacy for female lawyers, Godbout has also become a voice for those facing domestic violence after overhearing abuse in a hotel and writing a poignant editorial in the Telegraph-Journal last year. The story, addressed to the “Woman in Room 805,” went viral, leading to a flood of messages from women who have reached out to her to say, after reading her piece, they had the courage to get out. To this day, she is still haunted by what she heard and hopes the woman in the room is OK.
“An entire demographic now knows there is someone who can hear them on the other side of the door, and doesn’t know what to do, and is profoundly worried about them – I think a lot of them have felt for a very long time that nobody cared,” she says. As appeared in the Telegraph-Journal May 12, 2017. Silas is almost 2, and as I look back at my running achievements over his short life, I can’t help but feel proud. Last year included two half-marathons and a number of shorter races, which I managed to train for while working a full-time, demanding job. Now I am less than two weeks away from running my first marathon. I ran 20 km on Sunday in one of my final long runs. Not pain free, but got it done. Stats here. Logging miles upon miles to get to the finish line is never easy. Throw a child into the mix and the dynamic of finding balance in life becomes even more tricky. But I am here to tell you it is possible – not only that, but it makes you feel good. Running is a gift. It’s a place to focus, work out the day’s problems, dream and plan. It’s for me and me alone. This might be why I enjoy running solo. It sounds cliche, but I know that if I am at peace with myself, I am a happier person and a better mother. It’s also a way I can take control of my body and my health. To work on improving my speed, endurance and strength (both physical and mental). Everyone is busy, not just moms. But there is a particular part of motherhood that involves giving of your whole self every waking moment. It often feels like there is absolutely no time to spare. So here is my secret to fitting running into the equation: make it a priority. When you have that figured out, you quickly realize all the rest can fit in the tiny cracks that surround your busy schedule, and it doesn’t matter if that other stuff (i.e. house cleaning, Facebook, painting my nails) doesn’t get done. Everyone has different priorities, but I have chosen to make running mine. It matters to me and I know it makes me a better person. Plan ahead: I roughly know what days I’m going to run, the distance and what time will work best. On my days off, I typically run during nap time to maximize time with my son. On weekdays, I opt for early morning runs. Be flexible: Sometimes things don’t go as planned. Like I am just about to head out the door for an early morning run and I hear “mama!! !” So I keep on my running clothes and try for a lunchtime run. If that doesn’t happen, nighttime treadmill run it is. Use the running stroller: We usually get out for one stroller run per week. It’s tougher than running without but my son loves it. He says “wheeeee!” when we go fast and “runrunrunrun!” I love it. Set achievable goals, gradually: I didn’t start running again until a good two months after giving birth. After that, my first goal was a 5K by Christmas, when Silas would be six months old. I was so proud to finish! Then, four months later, I ran a 13K race with another mama. Three months after that, it was a half-marathon, followed by another one in the fall. I kept running through a December run streak to keep my base strong before launching into marathon training this past January. Be realistic: I don’t try to be perfect. I miss some runs and mis the mark on my mileage many weeks. I love French Fries and McFlurries as much as I love a good protein smoothie. Many days, I don’t get enough sleep or drink enough water. Sometimes I feel like an imposter in running gear. But I guess that’s also part of the appeal. I’m working on becoming someone I never realized was possible. And that will always be a work in progress. This image is forever etched in my mind: my husband gingerly carrying our newborn in a car seat down the hall of the hospital. I carried a few bags but I kept stopping to take photos. I had only given birth about 30 hours earlier and emotions were spilling out of me. It was really hitting me that this was a huge moment. We were taking our baby home, and our lives would never be the same. Now a year has passed and the thought still rings true. Except rather than a dream or an idea of being a family of three, we’re living it. 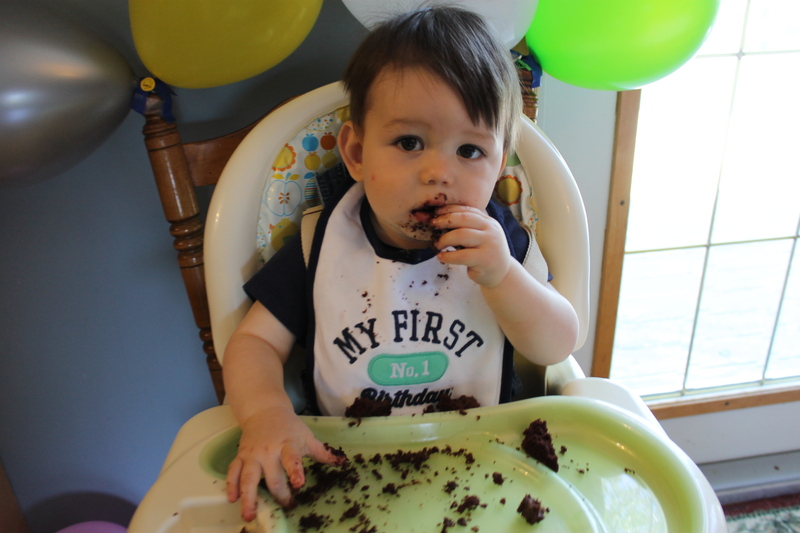 Three weeks ago, our son reached his chubby little fingers into his first slice of chocolate cake and devoured it. We sang Happy Birthday and surrounded him with family and friends. I always thought baby birthday parties were sort of foolish, but now I get it. It was as much about us as it was about him. Together, we made it through the most challenging and beautiful year of our lives. No one can every prepare you for how difficult it is to care for a newborn, as a sleepless, anxious new mother. But as time went on, and we got a little more sleep, it got easier. Before long, we were going to Stroller Fit and baby massage classes. We made a grand event out of grocery shopping. Breastfeeding eventually felt normal and we would do anything to make Silas smile. Just as we were getting the hang of this new life, we were blasted with the snowiest winter in 50 years. Silas didn’t really like to nap, except in my arms. I begged for a chance to shovel snow so I could get outside and breathe fresh air. Maternity leave was anything but a cakewalk. But we had a lot of fun too: we’d go to playdates and swim dates and movie dates. I started running again. We made new friends and learned new songs. We finally figured out routines that worked for us, and eventually, Silas didn’t need me as much, which felt bittersweet. We’ve watched our boy, Silas, grow into his own little personality. He is happy, adventurous and smart. Confident, yet sensitive. An old soul. A piece of us, only better. One year is all it took to make us see the world so very differently. It’s so easy now to understand what is truly important. And as our baby becomes a toddler, we’re celebrating that. 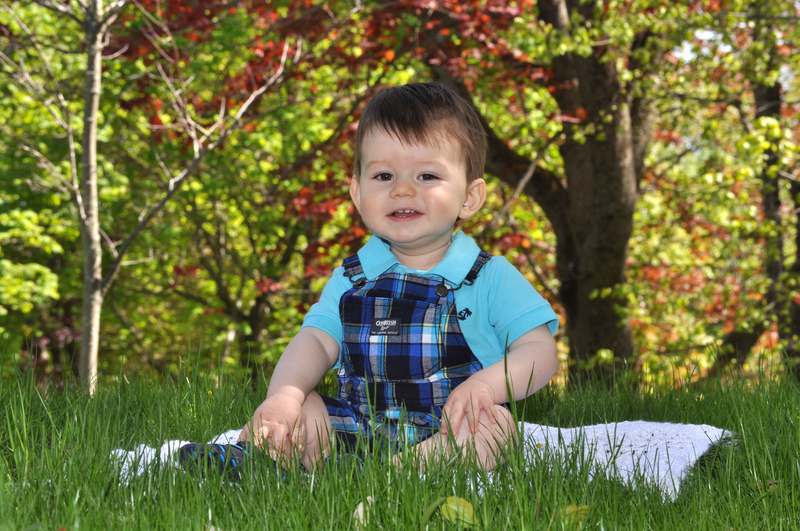 Silas is one year old. Photo by Cindy Wilson. Motherhood. It’s just so huge. There is so much love around that word: mom. And motherhood is not something you can pin down. It is every day. In every breath. It is my life now, and I love it. It is waking up when you want to sleep longer, and cleaning, rocking, feeding and laughing. It is exhausting and wonderful. All of this, I learned from my mom. Our home was always filled with her love and warmth. She was always attentive and encouraging. She let us make our own mistakes. She wouldn’t let me quit piano lessons. She trusted me and showed me how to care for my younger siblings. She is the most selfless person I know. And I can only hope to be half the mother she is. Posted on May 9, 2015 May 9, 2015 Categories FamilyTags mom, mother's day, motherhood1 Comment on Thank you, Mom. I can feel it, him needing me less. And it hurts a little bit. He’s only 10 months old, but every day, he is more and more independent. The way he mimics sounds and daydreams in a corner with his blocks. The way he is satisfied with a sippy cup of milk instead of me. The way he no longer needs to feel my warmth to stay asleep. As he reaches out into the world, smiling at strangers and cooing at cats and dogs, I am overwhelmed with pride. I am consumed with love. But there is also a little part of me that wants him to stay small and needy. It’s almost the opposite of how I felt during his first weeks of life. 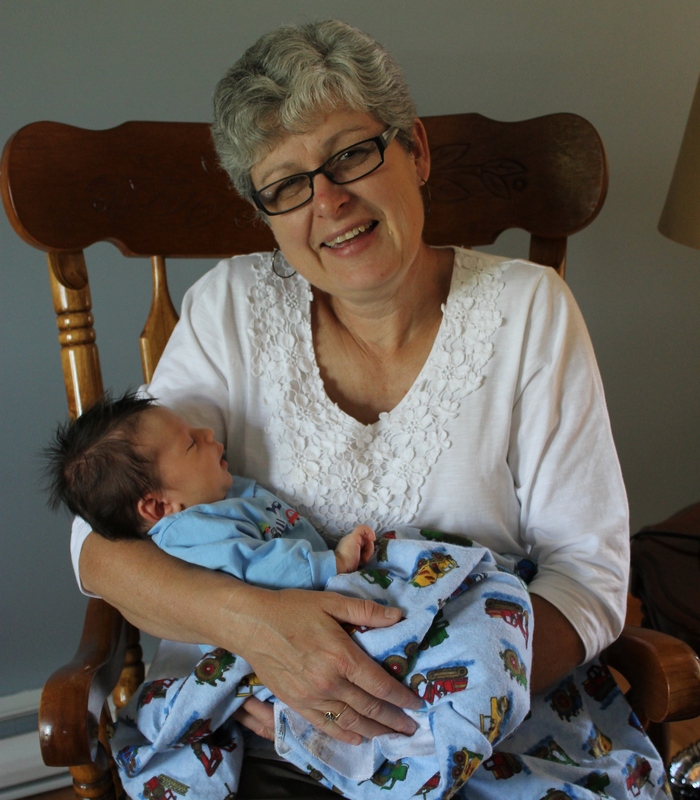 I loved holding and feeding my newborn, but his need for me was sometimes stifling. I remember the first time I slept without him on my chest (weeks after he was born) and feeling like I could finally breathe. But now, as his weaning begins, I know in my heart that what the lactation consultants said is true. It will be much harder on me than on him. I find myself holding him a few moments longer than I used to after he falls asleep. I used to wait impatiently for his eyes to close, for his body to fall heavy. Now, as his little body relaxes into sleep, I find myself relaxing too, holding him closer and watching the peace wash over his face. He feels bigger every day, and I suddenly feel the relentlessness of time. And how precious these moments are. Silas and I on the day of my sister’s wedding. Silas was 3 months old. Photo by Amanda Barber.